The 2019 conference of the Austrian Studies Association represents a joint venture between Bowling Green State University, Ohio and the Paris-Lodron Universität Salzburg, Austria. This interdisciplinary conference will explore a broad range of issues related to migration in the context of Austria and Europe. The presentations will highlight artistic, cultural, economic, and political developments from contemporary and historical perspectives. Papers should be approximately 15 minutes in length to allow for some discussion at the end of each panel. Please note that the conference fee of $170 ($100 for graduate students who are unemployed) includes the reception on Thursday evening, breakfast and coffee-break snacks, and lunch and dinner on Friday and Saturday. Dr. Manfred Mittermayer, Director of the Literary Archive of the University of Salzburg. Max Kade Writer in Residence at BGSU Clemens Berger will serve as our writer in residence for the conference and will hold a reading. For assistance with registration or payment issues, please email Conference and Event Business Services, or contact at 419-372-7941. Detroit Metro-Willow Run Airport (DTW) is located about 70 miles North of BGSU. There are 2 terminals at DTW. McNamara Terminal services most international flights and Delta Air Lines. The North Terminal services all other domestic air lines. Toledo Express Airport is located about 35 miles Northwest of BGSU. Servicing Allegiant and American Airlines flights. 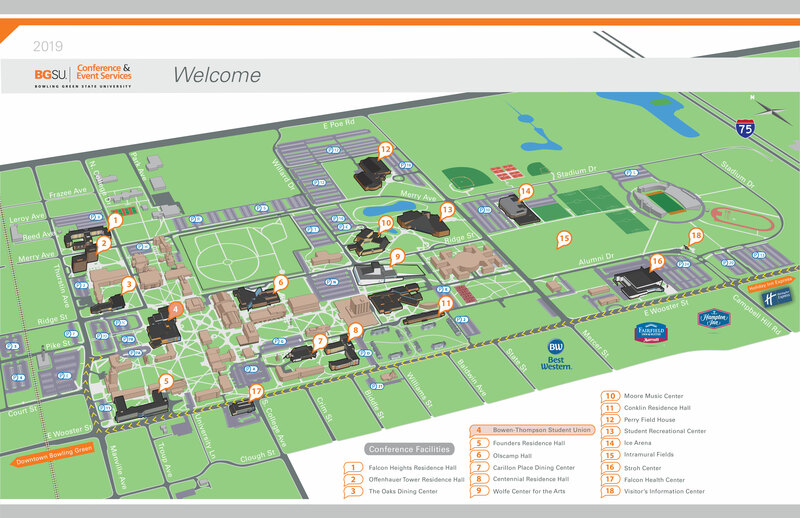 The most economical way to get to BGSU from the airport is by car rental. Please see the airport's website for listing of rental companies and information. Taxi, car service, and shuttles are also available. Average fare from Detroit is about $110. Visit BG Convention & Visitors Bureau for a few taxi/shuttle options available. Feel free to try to coordinate arrival and departure times with other colleagues attending to help reduce travel costs. For conference registration related questions, such as, payment, refund questions, or changes to registration, please contact BGSU Conference & Events Registration Services, eventbusinesssrv@bgsu.edu.